Do you need a wordcount challenge with some leeway? 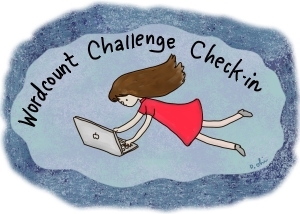 Check out the challenges below: 250 wds/day | 500 wds/day | 1000 wds/day So how did you all do with your daily wordcount challenges since the last check-in? 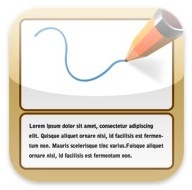 StoryPages can be used for sketching movie scenes, animations, and comics. Use it for keeping a record of your product ideas, visual instructions (for hardware, electronics, contractors and landscapers), help files, construction and restoration projects, teacher curriculum, travelogues, hobbies, dream recording and more. 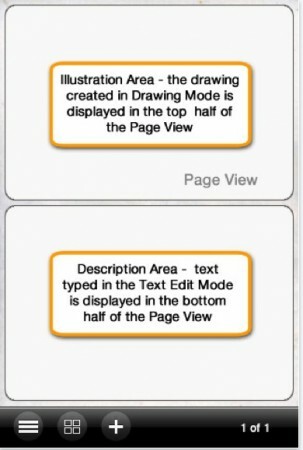 Instead of drawing right the app, you can import an image/drawing from the Camera Roll. This could be a handy brainstorming tool for a picture book writer-illustrator. 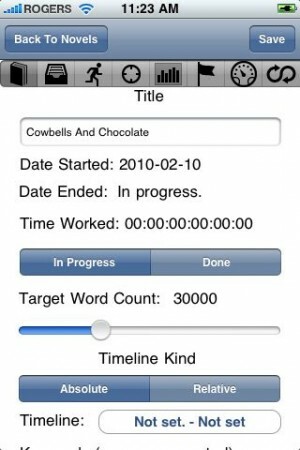 StoryPages is currently $2.99 in the iTunes store. You can find out more info as well as see extra screenshots on the SpinThought StoryPages website. I'll post a follow-up review once I've had a chance to use it for an actual project. 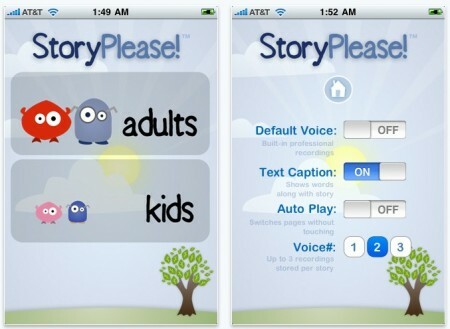 StoryPlease is a storytelling app that lets you record a story in your own voice, or your can use the default professional recording. I first came across the StoryPlease people (person?) when they attended the #kidlitart chat last night. During the chat, they said they were purchasing the rights to use illustrations/characters in digital format for the iPhone and iPad. For 99 cents, I couldn't resist buying a copy from the iTunes store to try out to see how useful this might be to picture book writers. However, it looks as though you can't add your own stories. The app comes with two stories, but it looks as if you have to pay to get more. Every time I tried recording a line, the app crashed on me, and I was also unsuccessful getting the auto-read function to work properly. 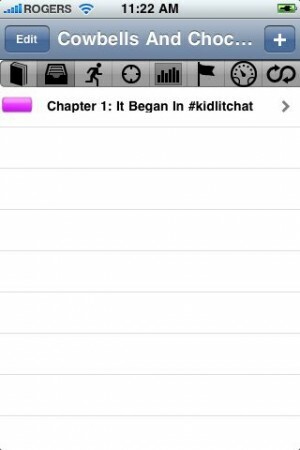 Unfortunately I can't recommend this for writers, but future versions of the app may be of interest to parents with young children, depending on what stories the developer adds. 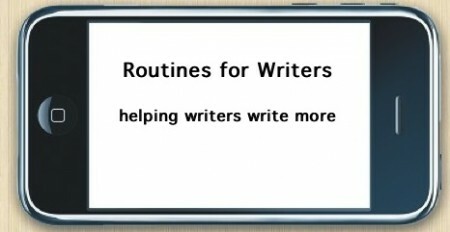 One of my favourite blog reads these days: Routines For Writers. 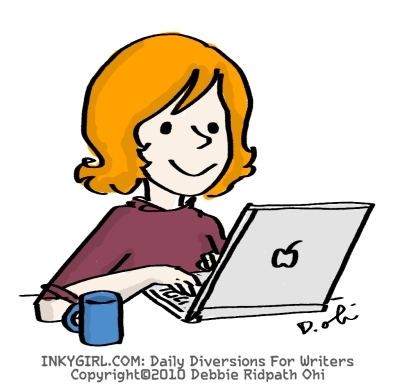 I've always -loved- reading about other writers' work habits, and that's exactly what Stephanie Shackelford, Shonna Slayton and Kitty Bucholtz talk about in this group blog. I have this site on my Daily Morning Read list for inspiration. Audio Footnote Demo from Eric Granata on Vimeo. 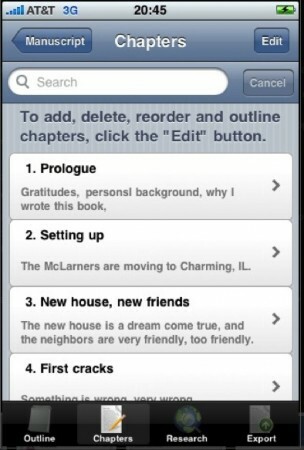 After reading Joe Wikert's review, I decided to buy this app. I've been listening to the audiobook version of Stein On Writing during some of my walks, and there have been times I would have loved to be able to jot down a note without leaving the e-book. It sounds as if this might help. I'll post a follow-up when I've had a chance to use it for a while. A while back I mentioned I loved Pam Bachorz's CANDOR (Egmont USA). I was inspired to post a comic about it. Not only was the site entertaining, but it's a brilliant book promo. I was inspired to create candorfl.com, first and foremost, because it was FUN. I spent countless hours of real towns' real estate sites, back when we were house-shopping in Florida, and I thought it would be very cool to give Candor, Florida a "real" web presence. And of course I figured this would be both a way to intrigue new readers and to extend the "experience" of CANDOR for people who had already read the book. I've gotten a lot of funny e-mails from people who visit the site--asking me for CDs to "help' their teens or for CDs to "persuade" their parents to do something. Some of the site's visitors, frighteningly, seem to take it as proof that the town really exists. I've gotten some very earnest queries for help from people who seem to think Candor, Florida will fix their family's problems and I can't decide if I'm being punked or if people are just really confused. I love when people comment on the bulletin board posts, on the site, offering to bring treats to the SAT study party! 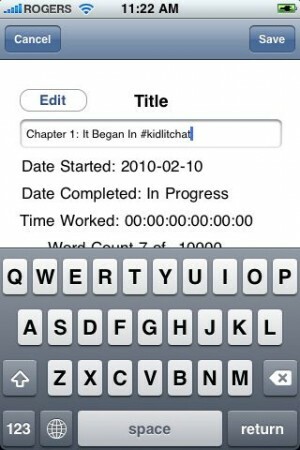 Announcing Manuscript version 1.0 by Aki » December 3rd, 2009, 1:48 pm Manuscript is a writing application that lets you outline, research, edit and export anywhere between a short story and an entire book – right on your iPhone! Manuscript is not limited to writing stories – you can use it for note-taking, project management, storyboard, mind mapping and much more. Create a manuscript from scratch or import from Google Docs (currently only Manuscript-formatted RTF is supported) Outline your manuscript using multiple levels In addition to Pitch and Synopsis, each chapter can be outlined individually. You can create empty chapters, outline them, and then pour content into them in any order you like. 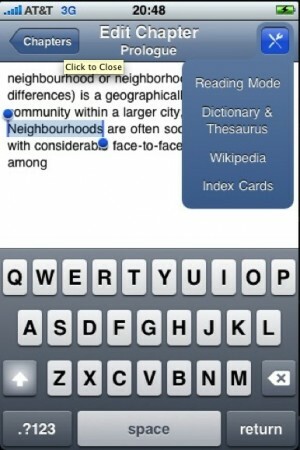 Use Wikipedia, dictionary and thesaurus from within the app. 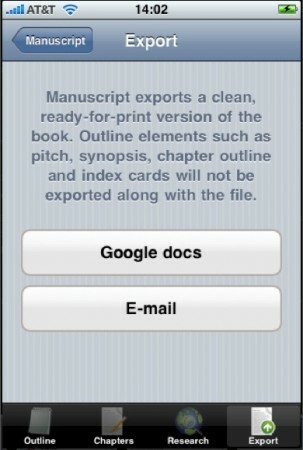 Export your finished manuscript to Google Docs as an RTF file that can be read by both Mac and PC. In Development: Currently, Google Docs does not support storing XML files, which means when you export a manuscript, only the text is exported, not the outline (pitch, synopsis, index cards and chapter outline). We are working on developing an alternative solution. Better import – so you can import any document, not just Manuscript formatted RTF files. 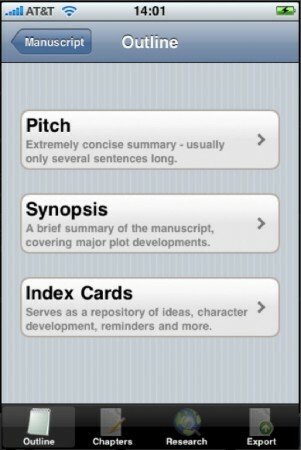 Hm...just noticed that they also have another app for writers in the iTunes store: Screenplay. Could be useful for writing my graphic novel scripts! If I like Manuscript enough, I might have to check out Screenplay. It also costs $7.99. I like the Pitch and Synopsis outlining areas; these are both essential for writers to help us sell our books as well as for keeping on track. 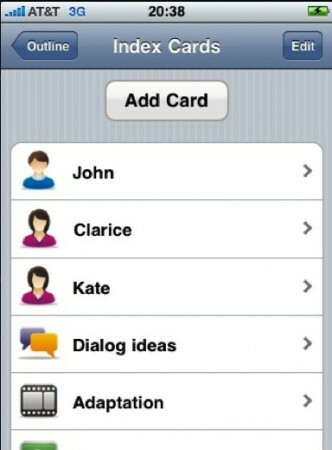 The Index Card section lets you add notes and reminders which can be associated with a particular icon as well as reordered. I'm going to test out this app more thoroughly over the next few weeks, and will write up a review of my experience to help you decide whether or not you want to fork over the $7.99 for the app. Where to find more info about Manuscript: Manuscript in the iTunes store Black Mana Studios Black Mana Studios forums for Manuscript Also see my other posts in the iPhone apps for writers category. I love this series of comics! Anyway, check out the latest: How To Use A Semicolon. Welcome to PublishersCafe, the unique authors' and readers' on-line coffeehouse where the ups, downs, positives and negatives of writing-related topics and publishing are discussed. Here you will discover the knowledge and experience to help you grow as authors, writers, publishers and agents. For more info as well as PublisherWorks updates, follow @corb21 on Twitter. The iPod is expected to hit Apple's online store and the company's retail outlets on Nov. 10. It will cost $399. 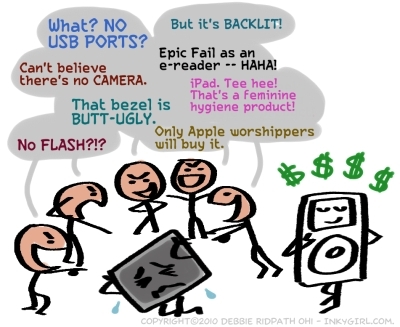 For all Jobs' excitement, though, Apple users at Mac discussion sites seemed a bit crestfallen that the device wasn't as revolutionary as the company had promised last week. Indeed, many said it was over-priced and under-powered. "Apple has introduced a product that's neither revolutionary nor breakthrough, and they've priced it so high that it's reminiscent of the Cube," a post on MacSlash said. The message then offered some ideas for what "iPod" might stand for. These won't make Jobs happy: "I Pretend it's an Original Device," it suggested, or "idiots Price Our Devices." And I was all excited they were going to release a OS X based wireless web pad. Instead we get yet another portable MP3 player .. "groundbreaking" I think was the term I heard them use to describe this new secret product the other day. How "groundbreaking" can something be when I can walk up the street and buy something with similiar (and in some cases, additional/better) features? Keep in mind it’s $400 right now becuase the Apple Fanatics will have to have one. They’ll pay anything for the latest cool toy from Apple. In 6 months, hopefully the rest of us will be buying the 20GB version for $200. I am very sad that Apple seems to be repeating the same mistake they made with the Cube - great, nifty product that anyone would love to own, except that it's burdened by an unbelievably poor price/performance ratio. Unfortunately $400 is about twice as much as I'd want to pay for something the size of a pack of cards. I don't see many sales in the future of iPod. Me? I'm still excited, and I'm holding off doing an iPad review until I actually have had a chance to use one. Also see the comments posted in http://ipadgirl.posterous.com. 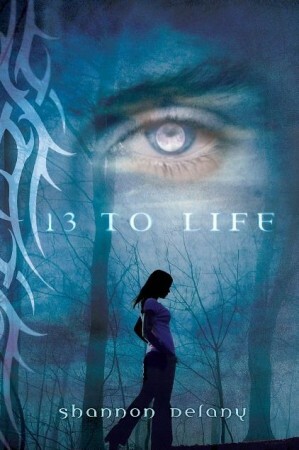 After posting short stories to Textnovel.com, Shannon Delany (previously writing as Saoirse Redgrave) ended up with a St. Martin's Press book contract for 13 To Life, a new YA paranormal werewolf novel. Shannon kindly agreed to answer a few questions about her experience: What got you interested in cellphone novels? I was a naysayer to Textnovel.com until they changed their contract to make things fairer for authors and then I decided to test the system by posting two stories. How did you find out about Textnovel (http://textnovel.com/)? 13 to Life started as just a title and a very vague set of characters. I wrote it "by the seat of my pants" and even had readers participate in polls so I could use some of their choices to challenge my preconceived notions of where the story might go and how characters might look. I posted 2 brief serial sections daily, each with a "hook and a hang." I incorporated the internet where and when I could to build more depth and interactivity (those links are now gone, though). Could you give me a one-sentence description of what "13 To Life" is about? How long is it? 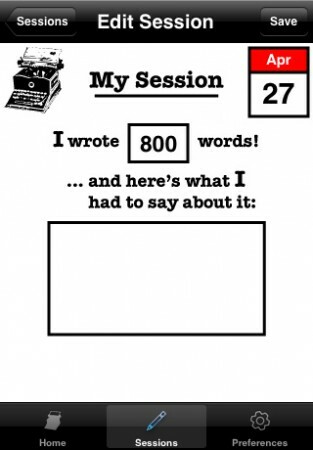 How long did it take you to write? My main one-liner is : A tale of teenage love, loss and--oh, yeah--werewolves. I went with this because although the werewolf presence is significant in the books, I'm dealing even more heavily with plain old humanity and our many mistakes and struggles. 13 to Life is not what many traditionally consider a standard werewolf (or monster) novel. I've had a number of authors who are generally not fans of werewolf stories say they loved mine because it wasn't the norm. The Textnovel version of 13 to Life took me five weeks to write (posting two short sections most days, morning and early evening). Then it was an additional month to flesh it out so I was generally satisfied. After copyedits I think the debut novel in the series is right around 370 pages (a far cry from the original cellphone novel which was probably around 50 pages). What was the Textnovel contest called? What were the rules? How much did you win? Geez. Hmm. In 2008 it was the only contest Textnovel ran, so I think it was simply Textnovel 2008. Rules were simple--you needed a certain number of "chapters" (I believe it was 20), you needed a decent popular vote (but didn't need to be the most popular), needed to show a strong marketable story and voice and integrate the technology available in some way (that last bit being more of a suggestion than rule). Two of my stories wound up in the top group as the contest was getting ready to close and I focused my attention on 13 to Life. I won $1,000 (which definitely helps on a farmstead during winter when hay's running tight). You mentioned that you got agency representation -- was this part of the contest winnings? Yes, I still sort of chuckle when people ask how I got my agent and I can say, "I won him." Were you nervous about being the agency's first client? What is the agency's name and what's your agent's name? Yes, I was definitely nervous about being the first client. I figured I'd be the guinea pig and that the third and fourth clients would benefit a lot more because of what my agent learned through working towards getting me published. I had a long phone conversation with him and (having heard a talented friend bemoaning the fact agents were nearly impossible to find) decided having someone in my corner was better than not having anyone. And, frankly, I'm a big believer that there's still a lot for me to learn about all this (and I hope folks have patience with me) so having patience with someone else as they start out is just sort of what I'd expect. How did your agent approach St. Martin's Press? Did he/she just send them your winning story? Propose a full-length book? etc. He actually put out a press release about the contest win and St. Martin's Press contacted us before queries were even out. Yes. I know. It all sounds crazy. Wow, exciting that a movie producer and another major publishing house contacted you as well! Did your agent approach them? If not, how did they find out about you? What made you decide on St. Martin's Press? Yeah, the sudden attention blew my socks off. And all that attention was totally unsolicited (just that press release). I remember giggling a lot during those first few months because everything was so richly surreal. My agent chatted with all of them and asked me if I didn't think 13 to Life could be a series. I had actually been chatting with my husband about that and knew I could get 4 or 5 books out of my characters and scenario with absolutely no stress, but I only really had three firmed up, so we asked about three and St. Martin's Press agreed. 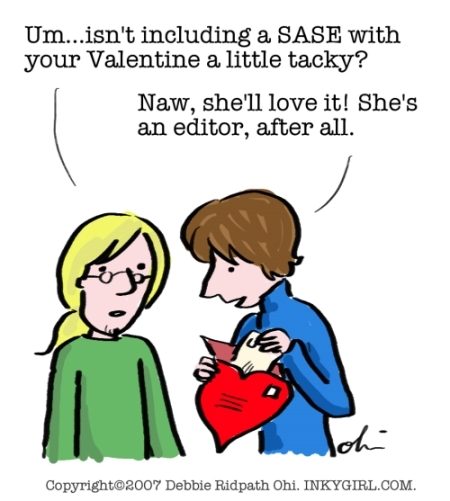 I think the thing that really made me say yes to St. Martin's Press was knowing how excited they were about my series and getting to talk to my editor quickly. Communication is VERY important in this business. Knowing my opinions and concerns are being listened to are big things for me. Was it difficult turning your cellphone novel into a "traditional" novel? How long did it take you? It took about a month. I knew from pretty early on what I really wanted to do with 13 to Life so it wasn't like I needed to build brand new subplots or deepen characterization--I just needed the time and space in word count to make it work. When I started 13 to Life on Textnovel.com it was November 24 and I only had until December 31 to complete it (and watch my son and run our farmstead)--there was no way I could pump out the quality and quantity I needed at that point for a full novel. Why did you decide on the pseudonym Saoirse Redgrave? I did it because I figured there'd be some backlash from people. One of my CPs told me repeatedly she didn't think my participation was a good idea and I wanted to be able to just walk away if the whole experiment was a failure. 13 to Life was what I call a "cannon fodder" story initially. I was just shooting stuff out there to see if I'd get anywhere near target. I had almost nothing invested in it initially--until I really found Jess's voice and I realized she and I have a bunch in common. The pseudonym was also partly because I know some people who have a real issue with fantasy or paranormal elements in writing and I balked at having them discover I was writing werewolves. Saoirse means "freedom." I think every author and artist should have that. But it's also miserable to spell, so now I'm being listed under Shannon Delany (Delany means "dark" or "defiant"). Eh. "What's in a name, right?" 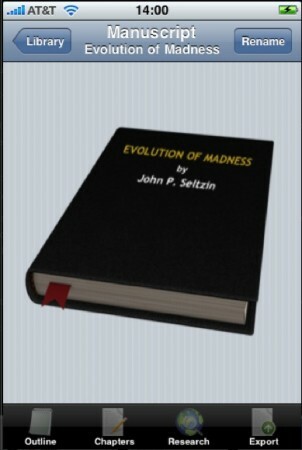 ;-) How are you publicizing the book before its June 2010 release? I joined 2k10 (a great group of YA authors making their debut in 2010), I'm lining up a blog tour thanks to some great authors who want to host me, I've reserved a spot at Free Book Friday Teens, I'm speaking at RT Booklovers' Convention in Ohio and I'm making it clear that I'll happily chat with nearly anyone who wants to talk to me or have me as a guest blogger. I was a teacher and I firmly believe that creative writing--and the arts overall--are necessary to encouraging the development of more creative personalities instead of destructive ones. Know a book club or creative writing group that wants a speaker? I'm game. We'll have at least one more book trailer for book 1, and I'm also being mentioned in a couple magazines between now and then. Once book 1's out and book 2's on its way we'll make an even bigger push (signings, a couple events to help service groups and charities I support--all that tie into the books) and the website will become much deeper and much more interactive for folks who want a more involved experience in the town of Junction. You can find out more about Shannon and her book on the Class of 2K10 site . 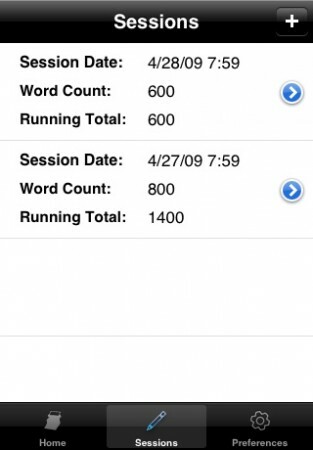 Writers with iPhone should check out Write Chain, an app which provides motivation by storing word counts for each writing session and tracks the total words written across all sessions. The "chain" part of the whole strategy is to try to write for as many days in the row as possible. If you miss a day, you break the chain...unless you change the settings to allow yourself some leeway. Cost of the app: FREE, at least right now. Check out the rest of the How Now Not To Write site for helpful tips for writers from Jamie Grove. 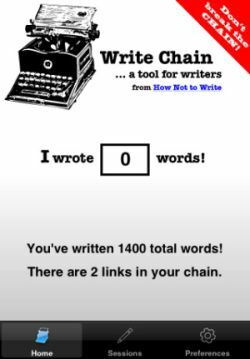 Found out more about this app at the Write Chain site. 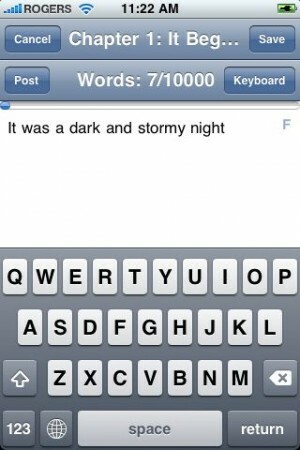 Related: List of other iPhone apps for writers.